Iyama makes best 16 in Samsung Cup: The opening round in the 2018 Samsung Cup was held at the Samsung Insurance Campus in Korea on September 4 to 6. 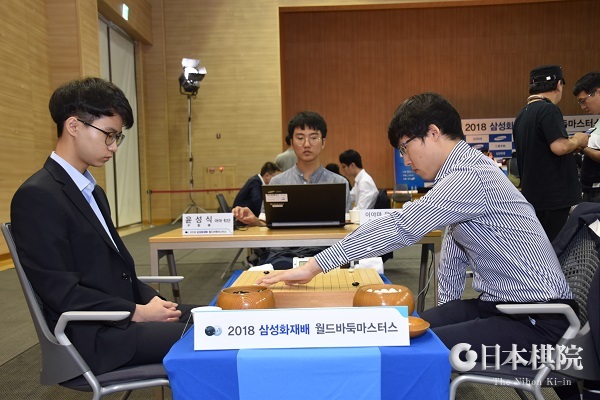 (It’s the 23rd cup, but apparently the sponsor is not numbering them that way any more; the full title of the tournament goes Samsung Fire & Marine Insurance World Masters Baduk 2018.) The first round is like a tournament in its own right: the 32 players are split up into eight groups of four, who then play each other. Two wins take you to the next round (whether your score is 2-0 or 2-1) and two losses (0-2 or 1-2) eliminate you. Japan was represented by Iyama Yuta 9P (right), Shibano Toramaru 7P (left), and Ryu Shikun 9P (right, below). The first two were Japan’s seeded players; Ryu won a seat in the Seniors division of the international qualifying tournament and was playing in the main tournament for the first time since 2001. In the first game (September 4), Shibano was the only one to pick up a win. He defeated Chen Yaoye 9P of China, who eliminated him from the Bailing Cup (see my previous report). Shibano had white and won by 4.5 points. Iyama Yuta (W) lost to Tang Weixing 9P (China) by resig. and Ryu (W) lost to Li Xiangu 5P (China) by 1.5 points. 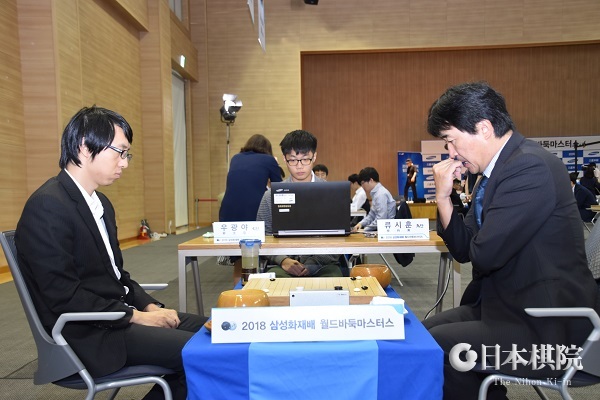 In the second game, played the next day, Iyama (W) beat Yun Seongshik (left, below), an amateur player from Korea, by resig. ; Ryu (B) beat Wu Guangya 6P (China) by resig. ; Park Junghwan 9P (Korea) (B) beat Shibano by resig. 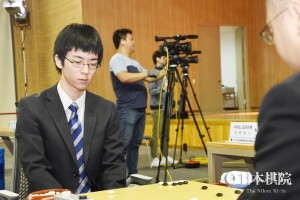 In the third game (the 6th), Iyama (B) beat Tan Shui 9P (China) by resig. ; Gu Zihao 9P (China) (W) beat Shibano by resig. ; Li Xiangu (B) beat Ryu by 1.5 points. Iyama was the only one to make it to the second round, but Shibano and Ryu were by no means disgraced, as scoring even one win at this level is impressive. Actually, Shibano was in what was dubbed the “group of death,” as the other three players (Park, Gu, and Chen) are all past or present world titleholders. 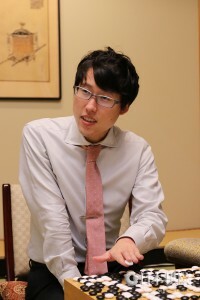 Ryu, who at the “advanced” age of 46 qualifies as a senior, was ahead in his third game, but slipped up in the endgame. He was chagrinned to lose twice to the same opponent by the same small margin. The second round will be played on October 1. 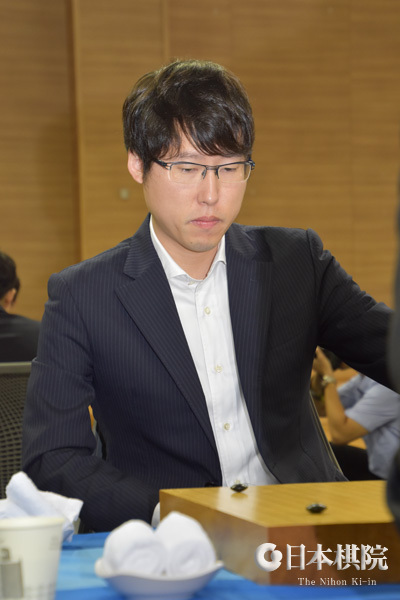 Iyama takes two-game lead in Meijin: The second game of the 43rd Meijin title match was held at the Kakujoro a traditional inn, in Tahara City, Aichi Prefecture, on September 12 and 13. Cho U, the challenger, is know for his skill at fighting kos and he seemed to take the initiative when he connected a ko in the first fight on move 55. However, there was a lot of action still to come: the game extended to 336 moves, making it the second-longest game in a Meijin title match. Both sides made mistakes or errors in judgment, so the lead shifted back and forth. The game was decided when Cho suffered a hallucination on move 253. This was decisive. Iyama (right) won the game by 2.5 points. Iyama: “The result of the ko fight at the beginning was not favorable for me. I thought it would be a drawn-out game, but I was not confident. 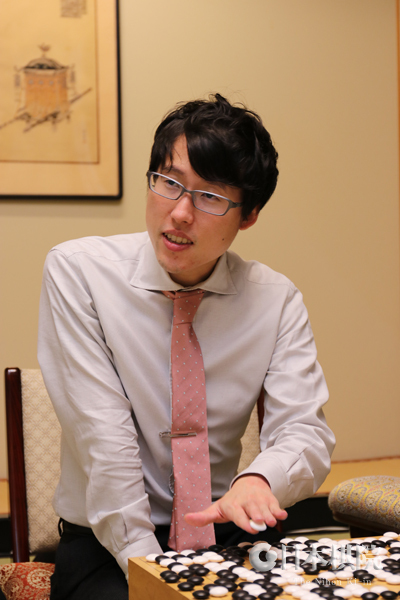 I didn’t have a clue about some of the things going on and thought I had messed up the game, but I took profit with border moves in the middle game.” Cho: “There were many positions in which I thought the game was easier for me. I got my last chance in the endgame, but I hallucinated and lost about three points. The content was not bad for me, so I will make a fresh start and do my best.” The third game will be played on September 25 and 26. Ichiriki to challenge for Oza title: The play-off to decide the challenger for the 66thOza title was held at the Nihon Ki-in in Tokyo on September 13. It was fought between two players younger than the title-holder Iyama Yuta: Ichiriki Ryo 7P (aged 20) and Motoki Katsuya 8P (aged 23). Taking black, Ichiriki won by resignation after 239 moves. He will make his second successive challenge for this title and his fifth challenge overall to Iyama. The first game will be played on October 26.